• Soil Health, Fertility and Sustainable Cropping Management Practices. • Sustainable Livestock Grazing Management Strategies. • Irrigation Water Management and Conservation. • Economic Sustainability and Agricultural Enterprise Management Strategies. • Native Plants, Specialty Crops, and Pollinators. groups of stakeholders associated with our Agriculture and Horticulture and Rangeland initiative teams. These focus group sessions were conducted at several locations throughout Wyoming. succession; and the influence of “new” landowners were important issues to individuals involved with agricultural and natural resources in Wyoming. The anticipated topics and educational activities in the following proposal reflect these explicitly identified needs. dominated by livestock production. The majority of farming is concentrated along river corridors and is irrigated. Much of the farming is for hay production for on-farm animal feed. The agriculture sector clientele has generally been in business for many years, surviving droughts and periodic low prices and would argue that their operations are “sustainable”. The professionals that serve Wyoming agriculturalists come from a variety of backgrounds and regions to serve UW Extension, Natural Resource Conservation Service (NRCS), and Conservation Districts (CD’S) predominantly. As indicated in the results of the 2004 regional SARE PDP survey, those WES professionals surveyed in Wyoming had a higher interest in the areas of livestock, grazing management and marketing. Their knowledge and utilization of sustainable agriculture programming provided in the state was limited probably because the programming was not specifically advertised as “sustainable ag” or did not fit their preconceived notions. The survey did not address other agricultural professionals such as NRCS and CD’S. further complicate identifying clients and their needs. Horticulture and small acreage landowners have increased interest in servicing these interests. Wyoming ES and SARE-PDP needs better targeting of educational topics and methods to reach professional educators, NRCS and CD advisors, and subsequently the producers. In past years, Wyoming’s WSARE Development Program had a decided and well-justified focus on travel scholarships to agricultural professionals to participate in professional development opportunities. This approach continues to produce meaningful educational impacts for the professionals and positive impacts to their associated clientele. However, our needs assessment discussed previously and feedback from our advisory committee indicate continued opportunities to expand our programmatic approach. In this project year, we will continue our successful soil health/fertility workshops, and video-based peer learning experiences. We will also implement regional workshops to provide experiential learning opportunities for Wyoming agricultural professionals in the coming year. These multi-day educational events will increase the technical knowledge and capacity of Wyoming agricultural professionals in topics such as wildlife habitat management, sustainable livestock grazing, irrigation water management, and invasive species management. These educational outputs will be in addition to our continued efforts to provide a limited number of travel scholarships associated with professional development opportunities for Wyoming agricultural professionals. a. Soil Health, Fertility and Sustainable Management Practices. • Agricultural professionals and producers (80-100 participants estimated). • Agricultural professionals (3 estimated). Our state programming strategy for SARE fosters the development and delivery of regional educational events with the explicit objective of engagement with agricultural professionals in Wyoming. These event promote awareness, enhanced teaching capacity, and peer-to-peer learning experiences on topics related to agriculture sustainability. In 2018/2019 SARE funding provided critical support for Fremont County Farm and Ranch Days, WESTI Ag Days, the Southeast Wyoming Beef Convention, and WY/UT Ag Days. These multi-day educational events provided over 800 agricultural professionals with learning experiences focused on sustainable agriculture. Include more topics related to sustainable agriculture in established annual UW Extension programs. SARE funds were used to support travel and speaker fees for specialists, producers, and UW Extension educators at 4 regional programs. Attendees at these events learned more about sustainable agriculture practices. WSARE funds were used to purchase eight soil and compost teaching kits for UW Extension Educators. 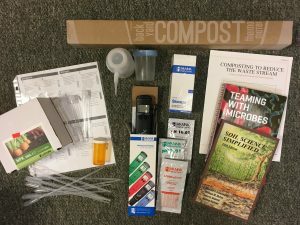 These kits included books and manuals, soil test kits, a compost thermometer and pH/EC meters. Training will be provided for all educators that receive these kits. UW Extension educators increased their knowledge and are more better equipped to teach classes and answer questions in the field. Incentive for rancher participation in educational events. WSARE funding supported and distribution of 250 “branded” NCBA-IRM pocket calendars. The demand for these “red books” is well established among livestock producers in Wyoming and they provided an outstanding incentive for rancher participation in our educational events. 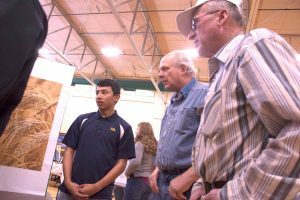 Twenty four students from the local high schools presented their ag science projects to an audience that included producers and ag professionals. The FFA Agriculture Marketing Team shared their project of raising crickets for human consumption and provided samples. There were minimal outreach efforts this year.